February 14th is Valentine’s Day in the US. If you are fortunate to have a special mate or partner in your life then, this is the time of year, men and women are called to open up their romance valve. For many, this has not been truly activated due to a full and active life where they have the feeling that there is little time to be romantic. For a select few, romance is not something you have to work hard at … it’s part of who you are. And you are living a romantic life daily. So, what does that mean? I once read that r omance is the water that nourishes a relationship – like a plant needs water to survive. I do believe you can survive without romance. Many do. I do believe romance is more like plant food that helps a relationship live a healthier, more vibrant life. However, one person’s idea of a romantic evening may differ from another’s. There are a variety of directions one can go. This alone can be a big issue in a relationship. Bottom line, romance is the act of making someone feel special and cared for, even loved and adored. It’s giving them your time and undivided attention. You need to demonstrate that you are thrilled to be with your loved one. And timing is critical. It has to be a time when both people can be open and present to the romantic experience. And isn’t the purpose of romance is to lead two people towards being affectionate with one another and maybe more? On the small scale, a romantic gesture is bringing a gift or flowers to your loved one. Hopefully it’s something they value and appreciate. Giving a woman perfume when she has allergies just shows you don’t know her tastes (and sensitivities) very well. Or giving chocolate to a woman who is focused on losing weight may not get a positive reaction. Knowing your partner’s goals and interests can give you clues on the right gifts for him or her. You don’t have to spend a lot of money to make a romantic gesture. A single rose can have more impact sometimes than a bouquet. Nothing says, “I love you” like jewelry! After the champagne is consumed, and the flowers wilt, she still has this symbol of your affection to remember you with and to show off to her friends. You can even make her a CD or a play list of your favorite music that you enjoy together. That would be romantic and lasting! Romance is a way of being. It&rsq uo;s giving your partner your full attention. So put away your cell phone unless you have children at home and need the cell phone to be accessible for emergencies. It’s the way you look at someone with your eyes looking into their eyes deep into their soul to see the person they truly are. Some call this the lover’s gaze. This emotional connection is the entrance to having a physical connection – holding hands, embracing, kissing and possibly much more! It’s romantic to share what you appreciate about your partner with that person. Expressing your feelings is very romantic and takes courage. And writing your feelings down in a card is a way to have that something concrete that some people enjoy reading again when you are not with your special person. Sometimes a small romantic gesture can go over big. I once had a boyfriend who came by with baked cookies for me. I thought that was sweet. A romantic gesture doesn’t have to cost a lot of money. It can be as simple as cooking for your loved one a special meal, or even cooking together can be considered romantic if done with the right ambience. And don’t forget, for those time starved professionals, bringing in dinner and having soft music and candlelight makes for a peak romantic experience. Of course taking that someone special to an intimate getaway is considered romantic. Getting a private room with a special view that is away from the hustle and bustle of everyday life makes a statement (unless you are up for a luxurious city experience!). This gives a couple a chance to relax which is very important to setting a romantic mood that would enhance a couple’s physical intimacy and enjoyment of each other’s company. I don’t recommend the getaway be a total surprise because that can backfire, especially if your partner needs to prepare for being away from home with a pet or if children are part of the equation. I once was put in very uncomfortable situation when surprised with an overnight stay after a party since I did not have a change of clothes or my toiletries for the next day or a way to care for my cat. So romance comes in all shapes and sizes, simple and grand. It all depends on truly knowing the person on the receiving end and what turns on your love interest. Everyone can be romantic. You just need to put some forethought and creative effort into making your time together a memorable experience. P.S. 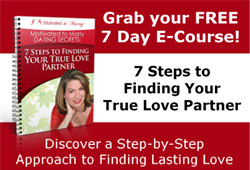 Get all my tools and strategies to help you update your online profile so you will attract the right love relationship this time around at www.SuccessfulOnlineDatingProgram.com.